As Afrin burns, where is the left? 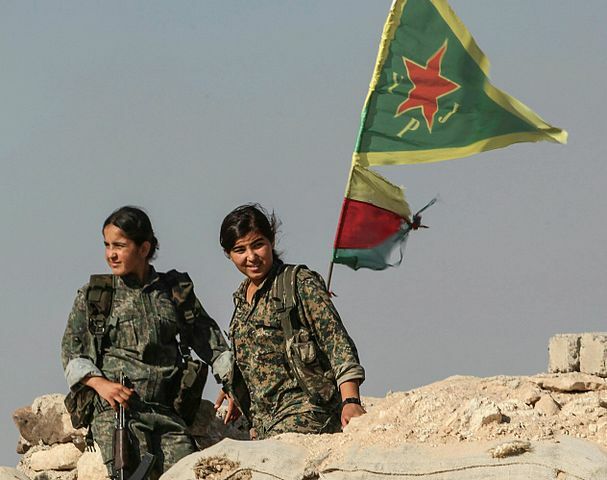 Syria (OpenDemocracy) – The unofficial motto of the Kurdish people is, as countless opinion pieces have reminded us recently, Kurds have no friends but the mountains. They make strategic alliances with great powers from time to time; but these, predictably enough, tend to end in betrayal. The vagaries of realpolitik do not lend themselves to lasting friendship. What is less predictable is the lack of support the Kurds have received from progressives. Turkey’s invasion of Afrin should be bringing the international left out onto the streets of all major capitals. Protesters should be pouring into Hyde Park with the red, white, green and yellow of the Kurdish flag as the chant “We are all PYD now!” fills the air. But they’re not. The streets are quiet — save a few Kurdish activists — and displays of solidarity are scarce. Compare this with the situation of another stateless people: the Palestinians. When the Israeli Defence Forces (IDF) razes Gaza to the ground, activists waste no time in donning keffiyehs and marching on Whitehall; violence in the Holy Land permeates the major periodicals and Israel is fiercely denounced on social media. Why, then, the relative silence when it comes to the persecution of the Kurds? An Islamist-nationalist government, headed by the demagogic Recep Tayyip Erdoğan, has invaded a foreign country with the help of local jihadis in order to crush a leftist movement. And this, furthermore, while he strangles Kurdish democratic aspirations at home. Where is the outrage? I have written about the Israel/Palestine side of this question before. The left is particularly attuned to Palestinian suffering because they are the victims of a western state — a settler colonial country formed under the aegis of a European imperial power. A shift in left-wing focus in recent decades towards anti-colonialism and anti-racism — and the related move from class to identity politics — has meant Israel’s “western” identity has moved the Palestinian struggle centre stage in the left’s political imagination. And, in the context of the war on terror, it has gone on to steal the show. Here, however, I want to explore why the Kurds, the world’s largest nation without a state, do not elicit the same passions. The problem cannot be ideological incompatibility. The Kurdish movement as it is currently constituted in Syria and Turkey (not so much in Iraq) represents the most progressive socio-political movement in the region today. Ideologically, they are more in tune with a leftist outlook than groups such as Hamas or Hezbollah, whose opposition to Israel has earned them a free pass within some sections of the “anti-imperialist” left. Afrin, the site of Erdoğan’s war games, is in northern Syria or western Kurdistan (Rojava). Here, the Kurdish Democratic Union Party (PYD) — an affiliate of the Turkey-based Kurdistan Workers’ Party (PKK) — and their YPG/J militias are carrying out a radical experiment in direct democracy under the banner of democratic confederalism. Formulated by Abdullah Öcalan, the imprisoned leader of the PKK, and inspired by the American anarchist Murray Bookchin, this is a form of libertarian socialism that focuses on social and environmental justice, and emphasises the end of patriarchy as a necessary element in the building of a better world. Critics argue that the democratic rhetoric is just a front for Kurdish separatism. Underneath the egalitarian veneer, they say, lurks a regressive ethno-nationalist programme. Perhaps. Ascertaining what is happening on the ground is never easy in a time of war and no organisation is perfect. But even if the critics are right, the available evidence suggests the PYD remains more progressive than the Islamic State (IS) jihadists they have fought off, the butcher of Damascus and his theocratic backers in Tehran, or the increasingly authoritarian Erdoğan. Knowing who to make common cause with should not be hard. For many, however, it is. One possible reason is the complexity of the Syrian civil war and the position of Kurdish forces within it. While the PYD and the Syrian Democratic Forces (SDF), the military coalition led by the People’s Protection Units (YPG/J), have made various alliances (most recently with Assad), they have benefitted mostly from US support. This is not on, apparently. Such alliances, in the eyes of some, have made the Kurds NATO stooges and are helping the west weaken the “resistance axis” which stretches, with Russian support, from Tehran, through Damascus, and into south Lebanon. There is some truth to this. The SDF’s alliance-of-convenience undermines Assad — even when taking into account recent developments — and puts a dent in Putin’s regional ambitions. It also makes Iranian expansion that little bit more costly. However, while there is an argument for preventing the collapse of the Syrian state, the idea that the powers propping up Assad represent a progressive force because they are fighting western imperialism and Wahhabist encroachments is fatuous in the extreme. The Moscow-Tehran-Damascus axis is no ally of the left or any movement concerned with justice and equality. Just ask the residents of eastern Ghouta. Geo-politics aside, there is another element to consider. As Rosa Burç and Kerem Schamberger point out in Jacobin, a tactical alliance with the American military does not mean the content of the PYD’s programme has changed. The Pentagon is not dictating the Kurds’ domestic agenda. Trump has no influence on the Rojava Revolution; he probably hasn’t even heard of it. Let’s accept that the difficulties of navigating the Syrian conflict account for some of the left’s silence on the Kurdish question. In the fog of war it is sometimes hard to make out who’s the oppressor and who’s the oppressed. This does not, however, explain the lack of solidarity offered to Kurds north of the border. In Turkey, the Peoples’ Democratic Party (HDP) have been persecuted by the government since winning thirteen percent of the vote in the June 2015 elections, temporarily upsetting Erdoğan’s plans to create a presidential system. Emerging out of the Kurdish rights movement and animated by the pan-Anatolian spirit of the 2013 Gezi protests, the HDP have seen their former co-chairs Selahattin Demirtaş and Figen Yüksekdağ arrested and scores of activists jailed. This process has only been intensified by the wider crackdown on Turkish civil society in the wake of the 2016 coup attempt. Judicial oppression soon morphed into violent suppression. In 2015, the peace process aimed at ending the nearly forty-year-old conflict between Ankara and the PKK broke down through a combination of political expediency by the former and miscalculation by the latter. The ensuing hostilities led to the displacement of hundreds of thousands of civilians in 2015 and 2016, and the killing of over 250 non-combatants in Turkey’s south east. But, again, the fate of the Kurds was met with near silence on the left. The reason for this selective solidarity was touched upon earlier. Kurds, it seems, have the misfortune of being victims of a “non-western” power and so their suffering barely registers. It is irrelevant that Turkey is a NATO power. Or a country trying to enter the European Union. Or just an autocratic state with imperial ambitions and a history of persecuting a local ethnic group. For many on the left, it is not “western” enough to care about and therefore its victims are invisible.